I think I should have shown this video first. Total thick oil, run time was only some 2 minutes. I guess slide oil doesn't like elevated temperatures! You have the worlds first hit and miss Stirling! EDIT: Sorry i was checking the forum while SWMBO was shopping. Now it really looks like a hit and miss, with smoke as well! Looks like it sucked the oil into the piston chamber. I'm a bit late in the day here, but if ever you need a new hot end, got a quick tip, the steel case of a size C Nicad battery has an outside dia of 1.02"/26 mm, and just under 50 mm long (the total length of the battery is 50 mm). When finished, I'm aiming for the hit n miss look. Using a pair of original diameter flywheels, which I've had cast specially for me. I'll remember that battery tip! Realising there was 4mm spare space below the piston, I made the new one 3mm longer. It stopped with a clunk, at the wear ridge made by the old piston! So, I shortened it....... It still insisted on hitting the wear pattern! The cylinder is 10mm bore, and the bottom of the fins is around 14mm dia. So, I can only afford a sleeve with a wall thickness of1mm. I have ordered a length of cast iron. I think I'll try a cast iron piston, too! David, there is a company called K&S that makes brass shapes for modelers. Maybe you've heard of them. They make thin walled brass tubing, and the brass is drawn, so quite hard. You might be able to use a 7/16"
.014" wall. I've used it for cylinders on wobblers. Might work out for you as a sleeve. It's quite tough. Should go well, with a carbon piston. A drill out and re-sleeve, with a longer piston is the way to go, I think! 1 mm, maybe thinner, it should just slide in with a bit of loctite. The cylinder of my smallest motor is 3/8" bore, cast iron, with a CI piston, skirt thickness .75 mm,crown 1.5 mm, a gudgion fork scews into the crown wit a 3 mm thread. Until I work out how I'll do it, photos can be seen on the ME & MEW web site. That's the stuff, David. With the .014" wall it will be minimal material loss for the cylinder to re-sleeve it. I keep a number of sizes of that tubing around. I always find uses for it. with aluminum and SS tube (and lots of other shapes and sheets, as well as telescoping round and square). YUP That's the right way to do it. David, I am joining this thread a bit late but admire all the work you have done thus far. Have you considered graphite for the piston? It would be self lubricating and thermally stable. I am surprised the oil in the power piston cylinder doesn't gum up some between runs. Just a thought. This little one is a similar size, power piston 3/8" x 1/2" stroke. The hot end is made from the steel case of a AA size Nicad battery. I've not dropped off the planet, just yet! ...... As a pal used to say. "Everything in me favour's, against me", at the moment. 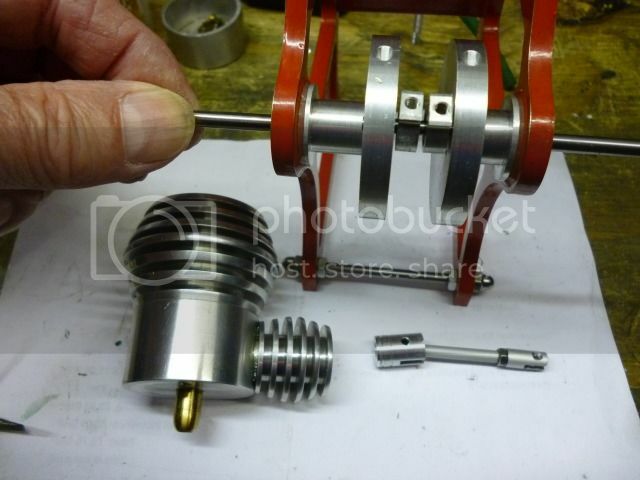 A bit of gung ho machining of a 5" flywheel, and the lathe gave a couple of gentle pops, and went into quiet mode! Since then, several aspects of daily life have gone wrong. And, a lot of other things haven't gone right. It's blummin amazing, how everything comes at once! The Maiwald parts lie just where I left 'em. Before they were covered with multiple parts from the stripped lathe..... Which is now rebuilt, again! Give me a few more days..... Probably! I got curious as to what kind of lathe you have and ended up reading the entire thread. Don't know how I missed it. Very enjoyable. Hope you get the lathe running again soon. Let us know what happened.